Baseball Jatropha, where’s my bat? A few weeks ago we made a visit back to Zone 9 Tropicals to pick up a plant they set aside for us. They were also having a fall sale so we came home with a few new friends. Most of our exotic plants, cacti and succulents live in pots on our big wrap around porch. They get wonderful afternoon sun and are kept dry from all our rain. 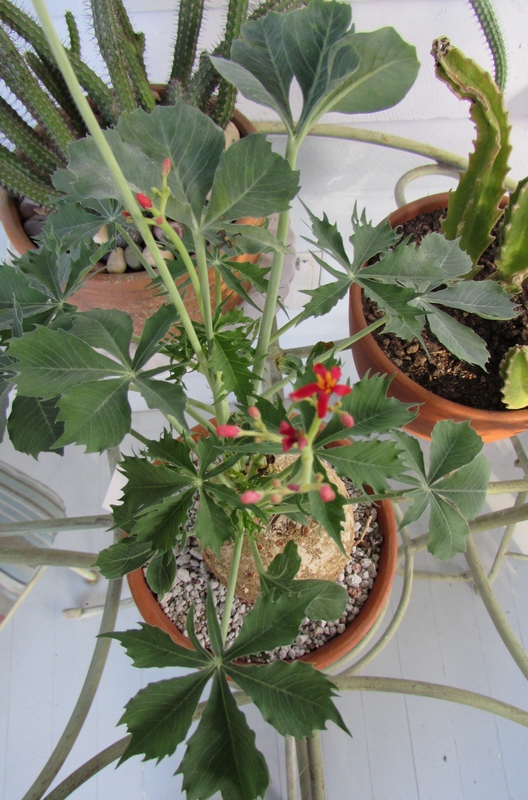 As we walked in there on the table sat a plant I had never seen but reminded me of my Desert rose (Adenium obesum). It was just darling and I was so happy to see a price tag that meant it was for sale! Baseball Jatropha, Jatropha berlandieri from the botanical family Euphorbiaceae. Baseball Jatropha, Jatropha berlandieri from the botanical family Euphorbiaceae. Also called Buddha Belly or Baseball Plant. 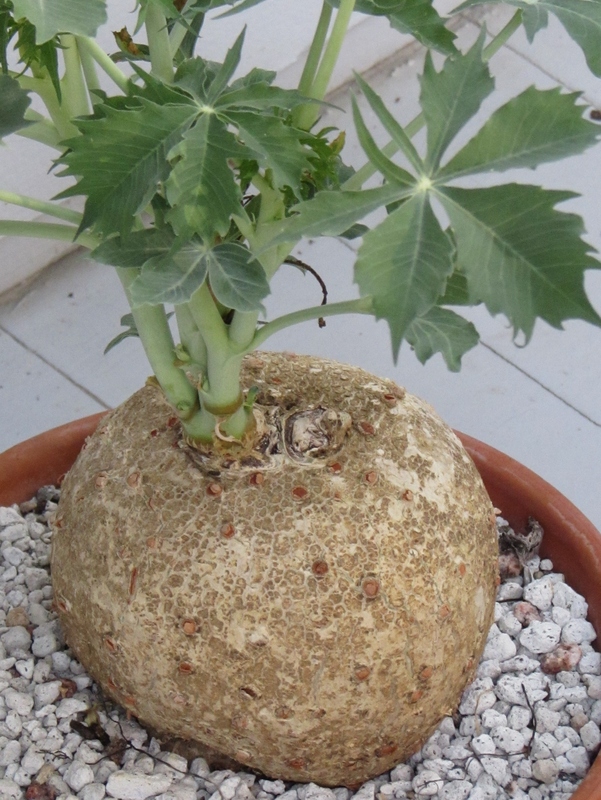 It is native to arid areas of Texas, Mexico and Central America and cultivated mainly for its unusual caudex. 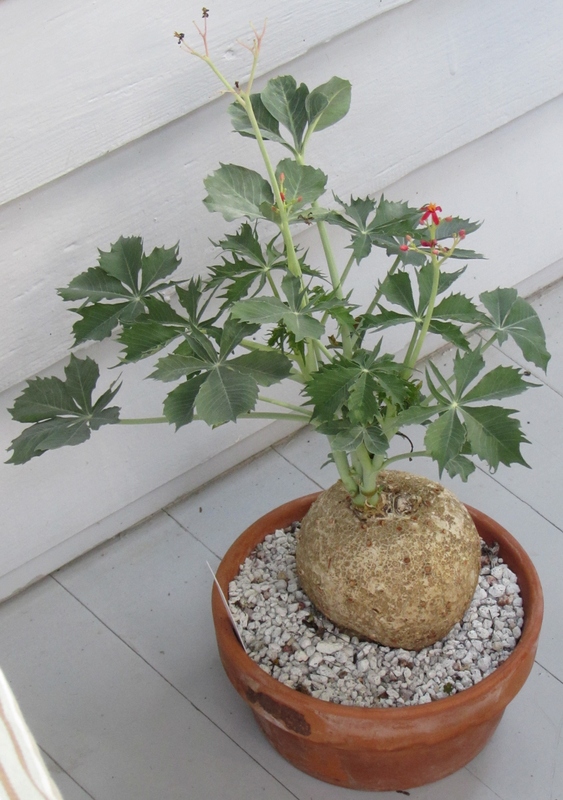 This dwarf Jatropha has a small round caudex or swollen truck. The leaves are deciduous and it goes dormant during the winter needing no water at all. In researching more about it I came across a post by The Plant Geek suggesting displaying it in a martini glass as art during the winter. The pictures are worth a look! These flowers are about 1/4 inch in size. 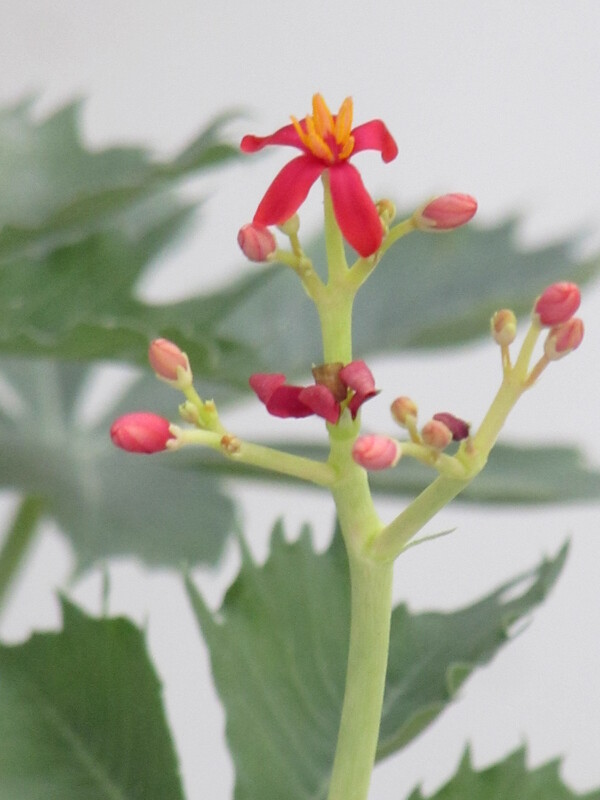 This small Jatropha’ s, nearing a foot full grown, thrives in a native environment with little rain and well drained soil. 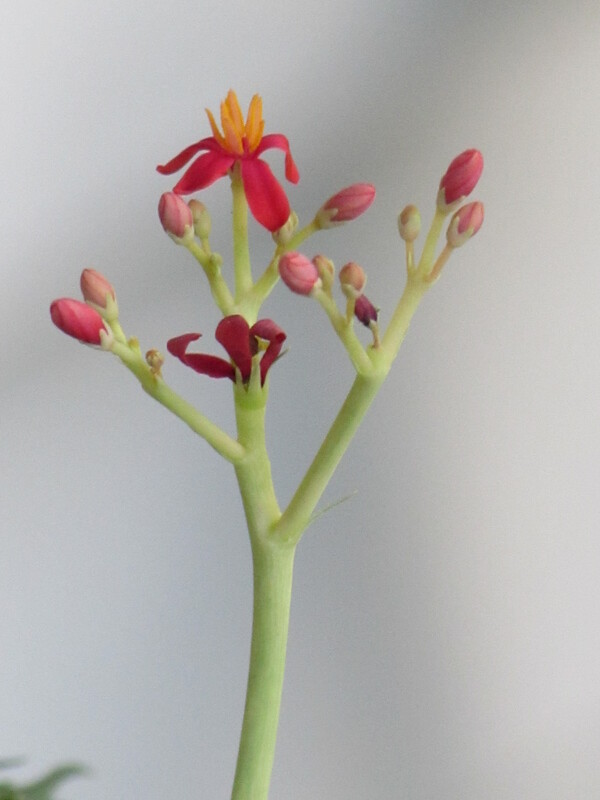 It is important to simulate these conditions if you want to grow a Baseball Jatropha . Of course the name comes from the rounded swollen roots that appear to sit on the soil like a baseball someone threw out into a field and forgot. Water stored in the caudeux is how it survives long periods with no moisture or rainfall. I was told to water it about 4 times per year. In the spring a green mound of leaves grows from the center of the top of the caudeux. This is followed by flower spikes with tiny reddish flowers. It loves lots of sun but not temperatures less than 50F. If it gets too cold or damp it can easily rot. In the fall it gets little green berries which can be harvested. Said to usually have 3 seeds per pod. When it goes dormant the stems can be trimmed and the plant put in a warm dry spot. Mine is planted in perlite but a light succulent mix works just as well. While it prefers full sun it can be kept inside with less light but it will not flowers as well. Top down view to see the leaves better. What is your favorite treasure at the moment? Cool plant. I just wouldn’t use it to throw a knuckleball. A great plant. I see you have it next to your Stapelia gigantea. I remember you showed us this in the summer. I’ d like to know your tips for getting the Stapelia to flower. Mine got several buds which was so exciting, but they all dropped off before opening. I don’t know but sometimes plants flower when they feel their life is in question, like oak trees putting out lots of acorns after a couple of years of drought, they feel they must produce seeds to carry on the species if you will. I think this plant might thrive on neglect and if it is over watered it doesn’t flower. This is a working theory I am testing!